Hay bale gardening can be a great way to grow lots of delicious veggies without a lot of work! Here are 6 secrets for growing a successful hay bale garden. Hay bale (or straw bale) gardening is a unique gardening method which uses hay or straw bales as a planting medium. Instead of planting your garden in soil, you will instead plant your vegetables, flowers, and herbs in bales of hay or straw. This method of gardening has several advantages. For one, it can be done in a small area – even on top of a concrete patio if you have no other place to put the bales. It also reduces the work needed to grow a garden. Obviously no digging is required, and it can also reduce weeding, especially if you use straw bales. Plants grown in hay bales need consistent water…. …The problem with dumping a bunch of water on a hay bale, though, is that much of it tends to soak in and run right through. This where drip irrigation comes in very handy. In fact, it’s perfect for hay bale gardening, as the steady, slow drip of water will absorb easily into the straw, and the bale will stay more consistently moist…. If you are planning on growing a garden in straw or hay bales, I would strongly recommend drip irrigation. But don’t make the same mistake I did, and wait until mid-summer! Lay the hoses out early while the plants are still small, even if you don’t need to irrigate yet…. …Planting starts/seedlings directly into bales works great, but if you’re trying to direct seed, put a good layer of dirt on top of the bale first – unless you’re planting large seeds like peas and beans, which can be directly pushed down into the bale. Remember that you will need to fertilize your bales ahead of time to encourage decomposition and raise nutrient levels in the bales before planting. I sprinkled bloodmeal and also put several shovelfuls of compost on top of each bale a few weeks before planting, and let the rain wash it all down into the bales a bit…. Lesson 3. Give Your Plants Plenty of Space!…You will want to watch the spacing of your plants not only in the bales, but also the spacing of the bales themselves, as I will discuss below in more detail. Lesson learned, I pounded a couple of stakes inside each cage, down through the bale and into the ground beneath. This kept them more or less upright for the rest of the season, although I nearly killed one of the tomato plants by putting a stake too close and breaking some of the major roots. This year, I will go ahead and stake the cages right away while the plants are small and avoid all the drama and trauma! If you are planting larger plants like tomatoes in bales, make sure the stakes go well down into the ground, and not just into the bale. When planting your hay bale garden, you will want to watch the spacing of not just your plants, but also the bales themselves. I planted some green peppers in an empty bale where I thought they would do well, but unfortunately it was a bale that was close to the squash bales. The squash in the nearby bales completely took over and nearly smothered out the poor peppers! By that time, the bales were well soaked and also well into their decomposition phase, and it was completely impossible to move them. (By the way, wet hay bales are VERY heavy!)…. 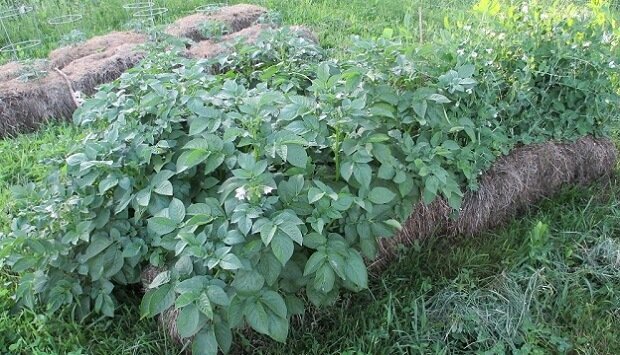 It is best to place your bales where you want them the previous fall, so they can get a good head start on decomposition by spring planting time. This means you will have to plan your garden well in advance – probably quite a bit sooner than if planting in regular soil, but it will pay off in increased productivity and reduced aggravation. Lesson 6. Some Plants Do Better In Hay Bales Than Others…I purposely tried to plant a wide variety of crops in the bales, to see which ones would do well there. Tomatoes, potatoes, summer squash, and melons all did great! Peas and salad greens did okay. Peppers and green beans did not do well (although the peppers may have done better if they weren’t over-crowded by squash, melons, and tomatoes). I may try a couple of peppers in a bale with more space this year, and would also like to try eggplant, which I only grew in the ground last year. The potatoes did the best – not only did they produce a great crop, but they were super easy to harvest, and really clean! The main problem with them was the field mice that began eating them shortly before we harvested. They also had some scabbiness on the skin, which I’ve heard may be due to the bales not being acidic enough. This year I will try sprinkling with sulfur and/or coffee grounds to up the acidity of the bales after planting. The tomatoes in general did great as well, although some of them seemed to have slightly smaller fruits than the ones grown in soil. The melons were amazing – beautiful, healthy, and prolific…. [Video] How Much Compost Do You Need for Your Garden?